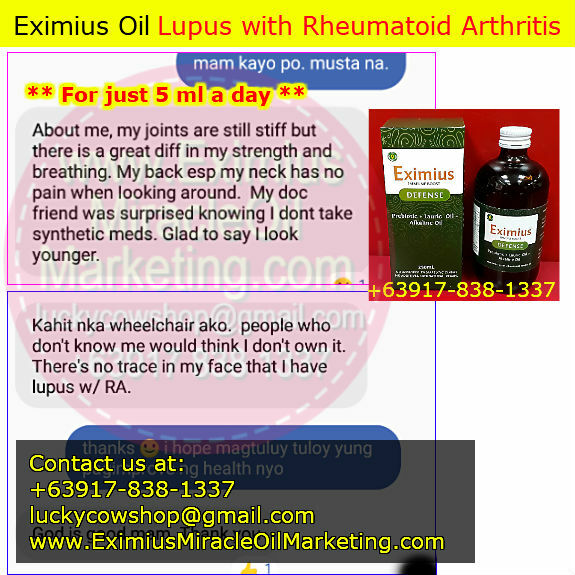 Eximius Oil on Lupus with Rheumatoid Arthritis Stage 4, For Just 5 ml A Day! 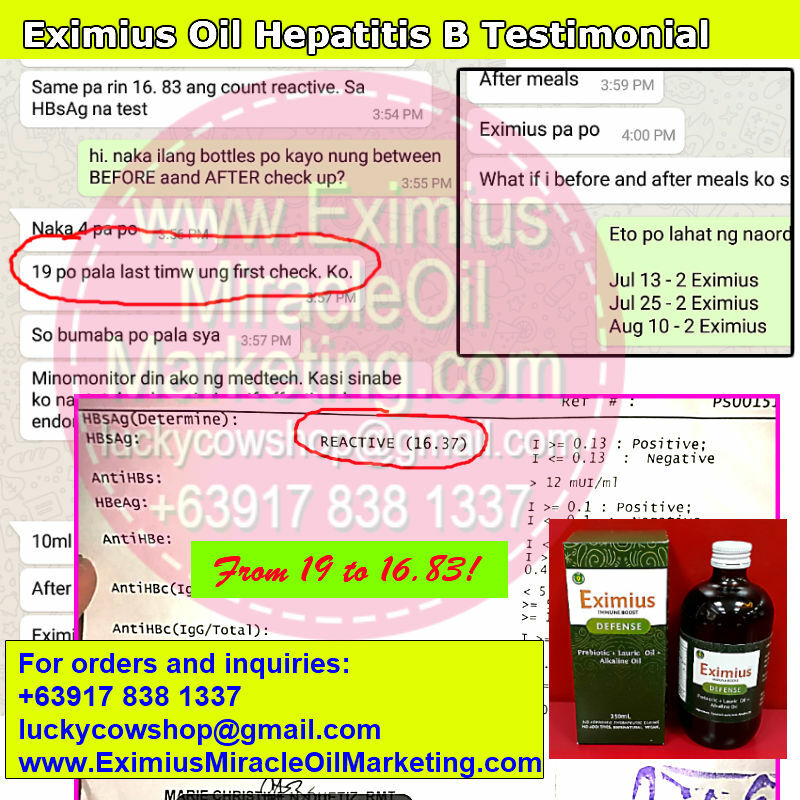 I am extremely happy with how Eximius Oil has helped my buyer on her very extreme condition. According to her, she has Lupus with Rheumatoid Arthritis. This is a very serious health problem. 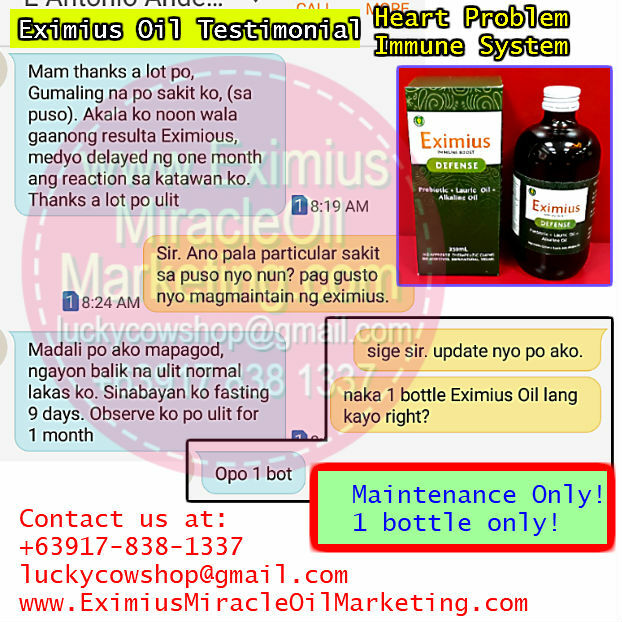 July 2018: On her 2nd bottle of Eximius Oil, she felt that the inflammation and the pain on her joints and muscles are lessen. She's taking Eximius Oil 5 ml 3x a day. October 2018: She's just taking 5 ml once a day. The back of her neck is not aching anymore. I usually ask updates from my buyers 1 to 4 weeks after they receive the oils. I ask for more updates when they purchase more, hoping to hear more good news from them. Me: Mam how are you? Buyer: About me, my joints are still stiff but there is a great difference in my strength and breathing. My back, especially my neck, has no pain when looking around. My doctor friend was surprised knowing I don't take synthetic medicines. Glad to say I look younger. Buyer: Even though I am on a wheelchair, people who don't know me would think I don't own it. There's no trace in my face that I have lupus w/ RA. 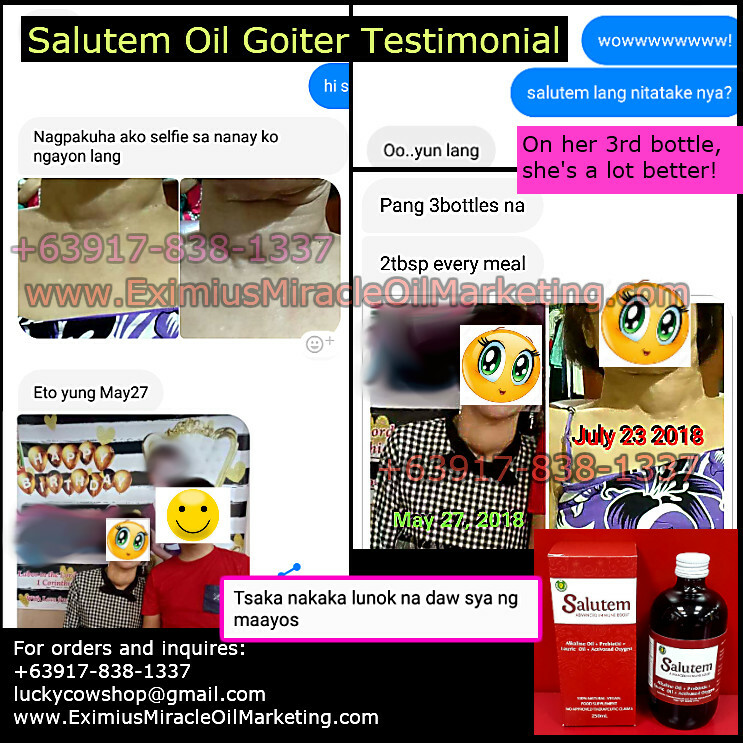 She's sharing the benefits of Eximius Oil to her family and relatives. 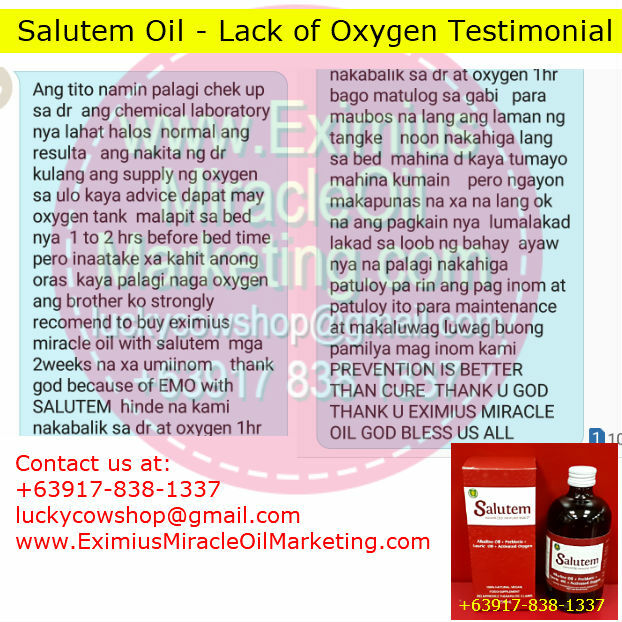 I am glad Eximius Oil is able to help more and more people. 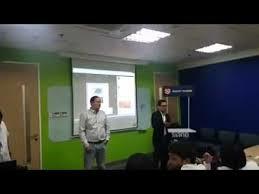 Health supplement has always been one of those that aids in health improvement. 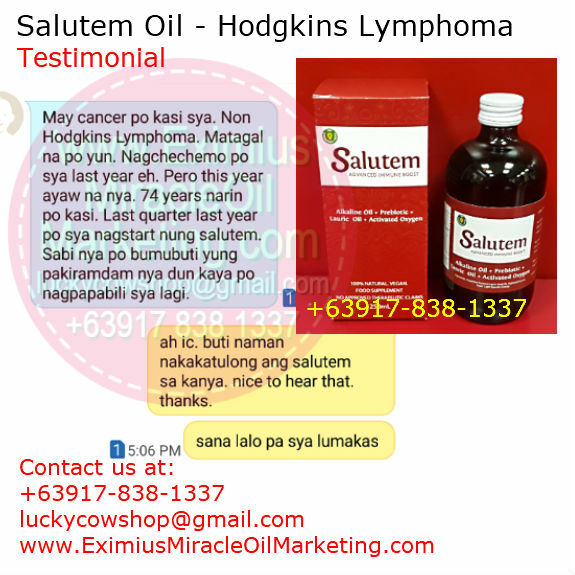 When it comes to serious health problems like Hodgkins Lymphoma, Salutem Oil does its job on providing effective health support. Buyer: She has cancer. Hodgkins Lymphoma. It was long ago. Last year (2018) she had undergone chemotherapy. But this year, she doesn't like anymore. She's 74 years old. Last quarter last year she started taking Salutem. She said that her health is improving that's why she's making a repurchase. Me: I see. It's good that her health is improving because of Salutem. Nice to hear. Thanks. Hope she gets stronger. If you know anyone who need to boost their health, or those with cancer or hodgkins lymphoma, or any other serious or light health problem, please share this supplement to them. Him: Just the same 16.83 count reactive. On HBsAg test. Me: Hi. How many bottles have you taken before and after the check-up. Him: 4. Correction, my first check up was 19. So the count is lesser. The medical technologist is monitoring my count... (messages blocked on the picture but it says: Because he says he will endorse what I am taking to others). Then we talked about how he take Eximius Oil. 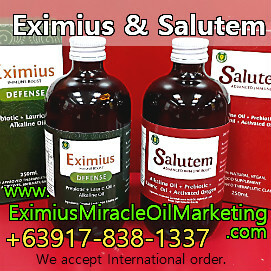 Eximius Oil give chance to all those who thought that there's no more chance to improve their health. If you know someone who needs help, who have tried to take medicine or other supplements but didn't work, do share to them this supplement. Let's hope that Eximius Oil and Salutem Oil will do wonders to them.